M12 has so many interesting cards, I'm not sure how we picked just four to review this week. Somehow we managed, starting with Bloodlord of Vaasgoth, a flavorful twist on the age-old "lord" mechanic. (He's also what the Vampire Counts in Warhammer Fantasy should have looked like - everyone already knows vampires are attractive and charming but not quite human.) He's on the expensive side compared to other lords, but I think there's some potential here. One of the perennial problems in a deck with both cheap and expensive creatures is drawing a cheap creature when you need an expensive one, and the Bloodlord turns any Pulse Tracker that comes down after him into a major threat. In more casual or larger card pool settings, black has lots of ways to make sure his and his followers' bloodthirst will always trigger, most notably Pestilence and Thrashing Wumpus. Even if he never makes it in constructed, the Bloodlord will be a lot of fun to play with. 3/3 with Bloodthirst 3, Flying, and gives each vampire you cast Bloodthirst 3. This creature is another nice addition to the family of vampires and if cast after the opponent takes damage a five mana 6/6 with Flying and no drawback is an excellent price for Black. Add in the bonus to any other vampire and you have a card that is well worth playing even with the slightly high casting cost. Overall this will undoubtedly see play in dedicated vampire themes, but Black has other heavy hitters like Phyrexian Obliterator competing for slots in the more general builds. In Limited this is a major threat as both Flying and a potential 6/6 for just five mana plus the two Black is manageable even in a deck running two colors. Any other vampires become more valuable in Sealed or Booster and should be drafted with a slightly higher priority as this should already be a first pick in Booster. In Sealed it depends on your pool, but a Black or Black/Red for burn damage can make Bloodthirst a bit more reliable. The Bloodlord may be slightly weaker as a topdeck, but in this format even a 3/3 Flying for five mana is playable and it should not be overlooked for this small concern. Welcome to another week of card of the day reviews here at Pojo.com. I hope everyone had an enjoyable 4th of July weekend. Today, we kick off the short week of reviews with Bloodlord of Vaasgoth. Bloodlord of Vaasgoth is a black creature, vampire, that costs three generic and two black mana. He has flying and bloodthirst 3, which means that if an opponent has been dealt damage before you play the Bloodlord of Vaasgoth, he comes into play with 3 +1/+1 counters. He is a 3/3 for starters, so that could make him a 6/6, for only five mana. His other ability grants bloodthirst 3 to each other vampire you play. Ah vampires. They always show up and make an impact. We should have seen this guy and his cronies coming when the Zendikar block made vampire cards really good. Luckily he will not be able to reunite with them in standard play for long, as the Innistrad release in October rotates out the Zendikar block in standard. But for that limited time, we could see some crazy decks built around this one. The bloodthirst 3 is so easy to get in M12. And being able to do it for every vampire is just insane. Imagine an already annoying Vampire Nighthawk, now getting pumped by this guys bloodthirst, that makes for a 5/6 with flying, deathtouch, and lifelink. Even smaller, still annoying, threats such as Child of Night immediately turn into serious issues. 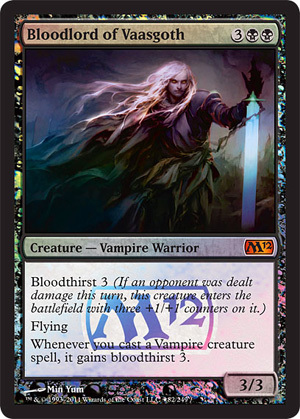 And the best way to exploit them is to run a deck type that still sees some serious play, red/black vampires. And in M12 there is one little critter making sure your bloodthirst triggers, Goblin Fireslinger. Vampire decks are aiming to reclaim a spot on top. They’ve been so close so often, but would eventually lose out to the control decks “controlling” the tops places. And with Bloodlord of Vaasgoth leading that charge, I for one think that black vampire decks, perhaps splashed with red, will be something to contend with. Also, you all can get your hands on a free Bloodlord of Vaasgoth by going to your local prerelease this Saturday, July 9th, because he is the Prerelease promotional card! Be sure to support your local gaming store, and get your hands on M12 a week before the launch!